Stop Summer Learning Loss: New Study Suggests B4K Students May Improve up to 2.5 Letter Grades. Kids may look forward to the lazy days of summer, but those summer months of relaxation have real consequences. Research shows that kids lose one to two months of learning during summer vacation, making summer brain drain a nationwide problem. Smart parents are taking charge to stop summer learning loss before it begins. The summer months — if used wisely — can help children grow their knowledge and practice new skills. While many different reading programmes aim to engage kids with the written word, far fewer opportunities exist to grow their skills in science, technology, engineering and maths (STEM) subjects in fun and engaging ways. That’s why parents love Bricks 4 Kidz. STEM skills can greatly diminish during summer months, but Bricks 4 Kidz offers a unique approach to building STEM knowledge. Summer camps focus on unique and fun projects that use LEGO® Bricks, and the results are incredible. Not only do kids have tons of fun, but they also combat summer learning loss by gaining real-life skills related to STEM, which they can apply when they get back in the classroom. How do Bricks for Kidz classes improve STEM skills? To better understand the relationship between the Bricks 4 Kidz programme and growth in maths and science skills, the company contracted with Advanced Education Measurement (AEM) to design a pre-test and post-test to measure students’ abilities before and after the classes. Improvement for students in After-School programs ranged from a 6.7 percent increase for Grades 3–5 to a 10.7 percent increase for Grades K–2. 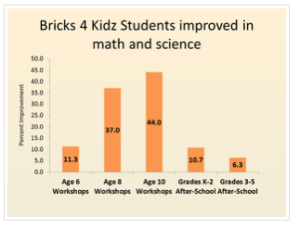 The improvement for students in Bricks 4 Kidz In-School Workshops is even more pronounced. Students in the Age 6 workshops improved 11.3 percent on the post-test, Age 8 improved 37.0 percent, and Age 10 improved 44.0 percent. For the entire study, the average child improved 24.4 percent on the post-test, the equivalent of two and a half letter grades on an in-school test. That means if your child is like the children in the study, he or she is likely to move their grade on an in-school test from a C to an A+ after participation in a Bricks 4 Kidz class or workshop. Bricks 4 Kidz summer camps offer a fun, informal way for kids to practice related STEM skills, which can help them stay sharp for when school resumes. “While AEM only examined two Bricks 4 Kidz programmes, we are optimistic that students in all Bricks 4 Kidz programmes, including summer camps, may exhibit similar gains,” says Dr. Bryan Shelly, president of AEM. Summer will soon arrive; will your child be sitting on the couch and binging on TV or taking a fun class that can fight summer brain drain and improve cognitive skills? Continue the important learning that kids completed in the classroom and give them an edge this summer by signing them up for a Bricks 4 Kidz camp today.